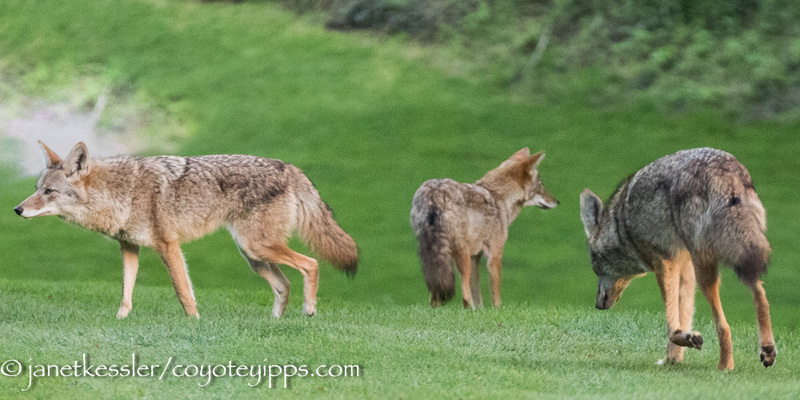 Magic indeed happens, even for coyotes, and it happened here just a few weeks ago. My observations on this particular evening was in a territory from which the entire family had departed several months ago except one 2-1/2 year old female. During the year previous to their departure, this yearling daughter had been excluded from family life mostly by her mother, and she was incessantly harassed by a younger brother, so she lived apart from them, on the fringes of the territory. She was determined to stay. Over that past year, the family slowly dwindled in size, which is normal as youngsters disperse: the remaining youngsters from three consecutive litters left one by one, and then, to my surprise, Mom and Dad left. Dad returned periodically every week or two, but those visits ceased. I don’t know why Dad and his mate left: Dad had been on this territory for 12 years — he had been born there and won the territory in a dispute we think with his brother. Anyway, 2-1/2 year old yearling now was all alone there. I found her frequently lying down on top of a knoll, or I would hear her howl all alone in the distance when sirens sounded. And then one day a several weeks ago . . . something began to happen! I reached the top of a hillock to find this yearling running towards me excitedly and maybe even a bit nervously. I was happy to see her energetic stride. And not far behind, surprise!, there came someone else . . . AND then someone else! These were two newcomers who looked strangely familiar, yet I didn’t know them. And then it struck me: I knew where they came from because of their uncanny resemblance to a coyote family in a nearby territory I visit occasionally. I have noted this before: there can be remarkable resemblances within some coyote family groups: in this case, blue eyes was one of the tell-tale signs. It didn’t take long for me to figure out that these two were males. Very exciting! The female appeared to be showing-off as well as showing them around. First of all, she showed off her knowledge of what was not dangerous by whizzing right by me. I watched the others follow her lead — to me they looked impressed. They kept a larger distance from me. She proceeded to convey her intimate knowledge of the territory to them by leading them through secret fence passageways and to the backs of houses, and they explored various well-known-to-her brush areas. They criss-crossed an entire section of the territory, marking and exploring and watching each other, and then as night fell they headed out into the streets of San Francisco. I turned back at this point: I was overjoyed for the little female. Three coyotes where there used to be one. The next day, I saw the interaction in this video. She seems to be hooked on one of the new fellas and was not afraid to let him know. Note that SHE is the one making all the moves while he seems almost to be putting up with her if not downright annoyed with her. Actually, simply allowing her to do this is his way of accepting her. Anyway, it looks like a relationship is in the making here! Thanks for all these dispatches from coyote world! I am so happy for her—she seemed so lonely before. And how hilarious she is with her antics around the male. They all look so healthy—a magical Friday post! Hi Hilary, SFFA, Alice and Elinor — Yes, the event is totally uplifting and thrilling, especially for this one who has been so alone for so long. 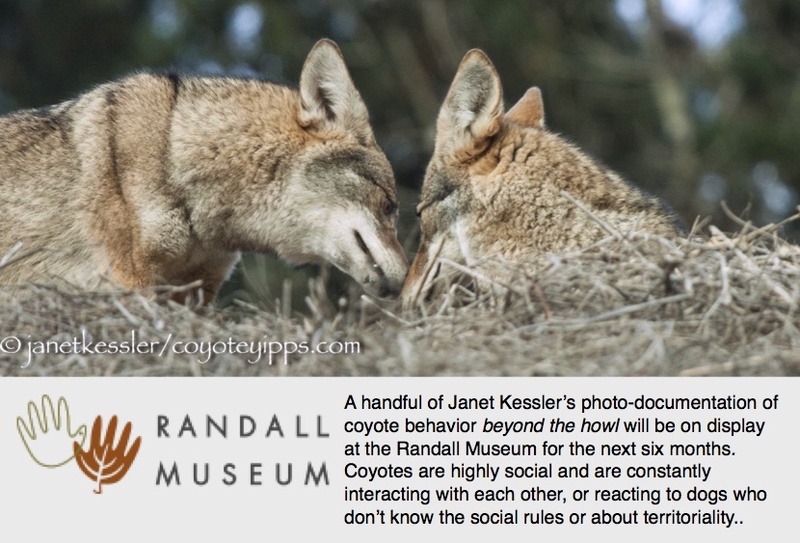 Coyotes are social animals, so they thrive on interactions. 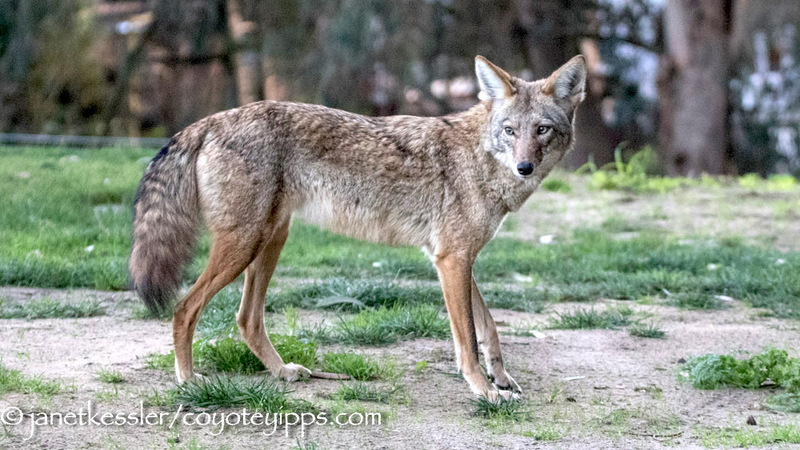 Coyotes can become lonely, and they can have yearnings. Read or listen to some of Carl Safina’s talks. I’m happy too! Grinning ear to ear! My heart is going to pop! THANK YOU JANET!!! Magic does happen. AMAZING! I wonder what will happen with the “extra” male? It’s never easy to be a third wheel, so I’m worried that he will be driven out. It will be interesting to see what happens! Regardless it’s great that she is no longer alone. Yes, it will be interesting to see this story unravel. I’m sure the two males are related — there is a family resemblance. They know between themselves who is the subordinate and who is the dominant. Until that is challenged, I think they’ll be fine together. . . . . To be continued!